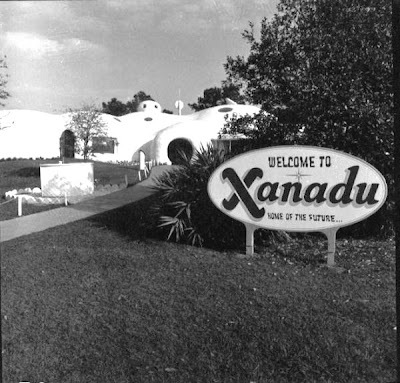 When we went on family road trips when I was a kid, it was extremely rare that my dad would pull over for anything cool and kitschy. 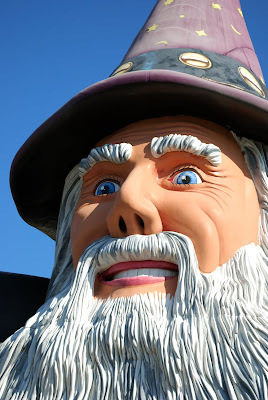 So now when I'm driving I have two competing voices in my head, that of my father's saying "gotta make good time and get there fast" and the other, that of the curious little kid wanting to stop at all the tacky tourist traps. 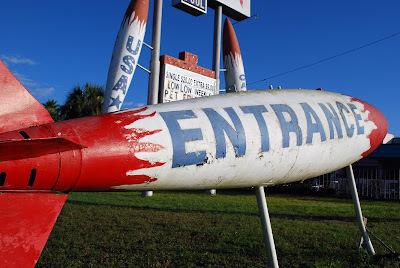 As I was headed up 1-95 for a quick delivery of some work near St. Augustine, I couldn't resist pulling over after a series of dayglow billboards advertising citrus, pecans and fireworks. Citrus has a long history in Florida, it is said that the first orange trees were planted by Ponce de Leon near St. Augustine between 1513 and 1565. Florida's climate proved to support citrus well and the citrus industry really took off after the Civil War. 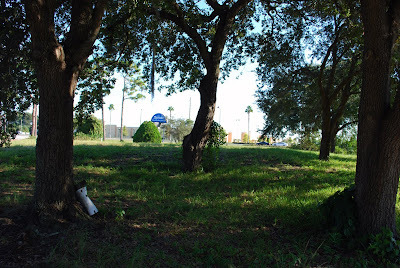 In fact, the parcel of land on which I live on was originally owned by a Civil War veteran named William Hull who is said to have developed the first commercial citrus in Central Florida. 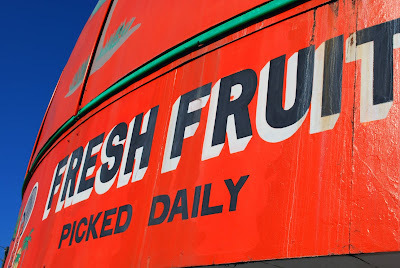 The citrus industry flourished in this part of the state until the 1980s when a series of devastating freezes forced the industry further south. Many of the former groves in this area are now housing developments. 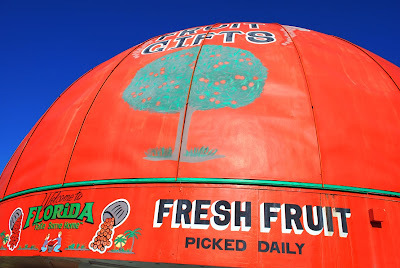 The roadside citrus stand has a rich history in Florida and is a topic on which I intend to explore further. 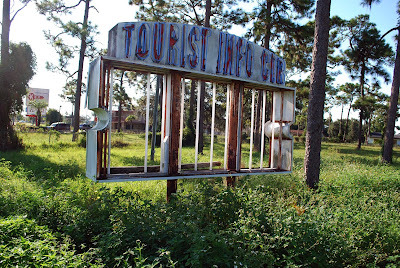 As I pulled off the exit in St. Johns County, I realized that there was not one, but three citrus stands near the interstate, all competing for drivers' attention with giant brightly lettered signs. Created from gas stations, these businesses are the contemporary equaivalent of old mom and pop produce stands, on a larger, tackier scale. 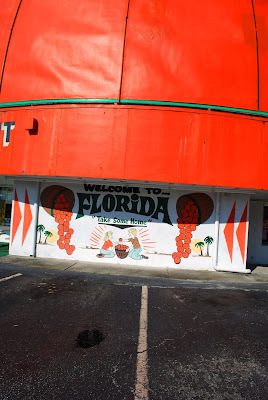 They appear to supplement the citrus sales with cheesy tourist souvenirs made out of shells, stuffed gator heads and other items that are vintage Floridiana. 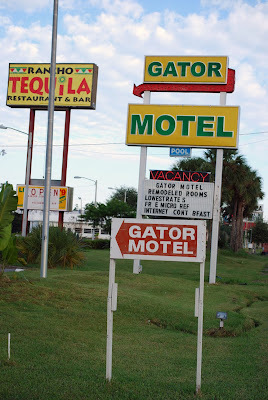 The billboards advertised a 13 foot alligator and I was kind of hoping to see it thrashing about in a small pond. 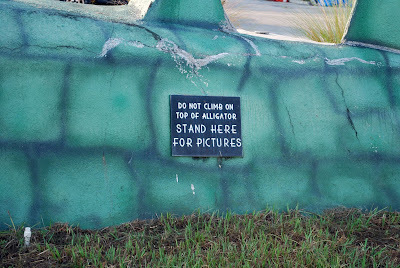 But it was stuffed, and used as a centerpiece for the display of hundreds of little alligator heads that could go home with you for a price. Also available were Florida-made preserves and honey, and many items made of shells. 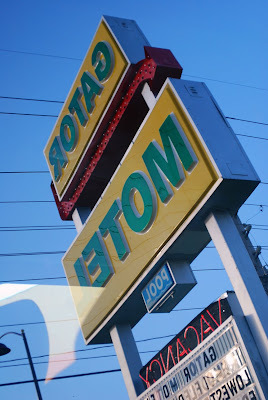 And although the space may have formerly doubled as a convenience store, it was now purely in the citrus and souvenir business as several irate drivers stopped in to find out there was no ATM or cigarettes available here. To me this is a modern day version of the roadside formula that developed years ago along roads like Route 66 and the Lincoln Highway. Only today it is geared towards the interstate traveler. While I left empty handed, it was refreshing to see that others left carrying a bag of citrus and that the tradition of the tourist trap endures. When my wife and I moved to this house, it wasn't because it was a charming bungalow on a shady brick street. 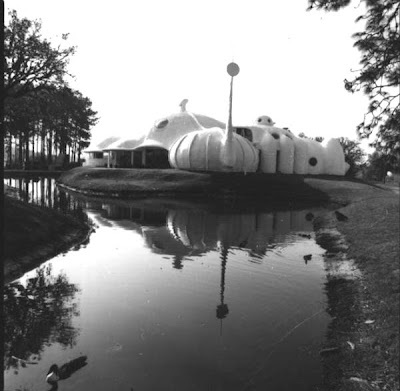 It was because the little house was situated on the edge of a small lake with an incredible waterfront view that was framed perfectly by a mammoth live oak. The tree's ancient limbs seemingly defy gravity as they stretch horizontally all the way across the back of our property to visually contain the lake in a way that cannot be ignored. It's like the tree is saying, "the lake is gorgeous but I demand my share of your attention." I liken it to an outstretched hand with thumb pointing upward and the four fingers pointing outward. On Thursday October 8th, I was watching television at about 9:15 at night, when I felt a big disturbance like a huge piece of furniture being knocked over. I ran to my wife in the other room, expecting to see her wrestling with an over-turned dresser, but she was headed my way to see what I had knocked over. Grabbing a light we ran outside and searched in vain for the origin of the ground shaking sensation in the rear of the house. Finally I noticed that a huge patch of sky had opened up in our shade-covered yard and was shocked to find large portion of our magnificent oak laying in the lake. The air was thick with sawdust and it smelled like a sawmill. As we approached the enormous limbs we could hear popping and cracking as the weight of wood was still settling, breaking other boughs. Knowing this instability could be dangerous, we left the tree for a restless night of worrying, waiting to inspect the damage at first light the next day. Just like a kid at Christmas, I ran out as soon as the sun peaked over the horizon. 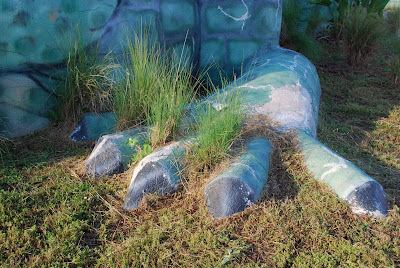 I was shocked to see that the huge vertical "thumb" had plummeted to earth and ripped off one of the giant "finger" limbs. The end of our dock was completely covered with debris and one of our chairs was perched perilously over the water. I began calling tree surgeons and learned that this "catastrophic limb failure" was a pretty rare phenomenon in a live oak which is the "densest hardwood in North America." Although I had at least 3 tree trimmers look at the tree in the 5 years since the hurricanes of 2004, I was worried that maybe I had been negligent in maintaining the tree, and somehow responsible for this, but was assured by all 4 tree guys that the tree was healthy and this was just a rare event where the tree could no longer support its own immense weight. The good thing is that they all agreed that the remaining "fingers" would be okay. So today the limb removal begins. I expect my yard will be damaged heavily by the tractor as they pull tons of wood from the lake, but I know by next summer, the restorative powers of Mother Nature will cover up any temporary scars in the landscape. Part of me wanted to leave the limbs resting in the water; as habitat for fish, a place for Anhingas to dry their wings, or spots for Wood Ducks to perch. But my neighbors, whose attitudes about Florida landscaping are already vastly different than my own, had already begin cutting at pieces of the limbs, impatient with my lack of action in the clean-up. It is sad to see something so mighty become relegated to becoming mulch. And I would much rather spend money on creating something, rather than destroying something. But I guess it is a good lesson in impermanence; nothing lasts forever so we should enjoy it while we can. I'm also grateful that the catastrophic limb failure occurred away from our house and not on top of it. And I'm kind of excited to see how the tree will react to being radically re-shaped. Will new limbs rush to grow towards the open spot in the sky, or will I have a new window to watch birds and sunsets? "Mr. Mott won a Nobel Peace Prize in 1946, served as General Secretary of the International Committee of the YMCA, was President of the YMCA’s World Committee and, during World War I when the YMCA offered its services to President Wilson, Mott became General Secretary of the National War Work Council and received the Distinguished Service Medal for his work. He kept up his work for the YMCA and helped to conduct relief work for prisoners of war in various countries. He had been offered the Ambassadorship to China under President Wilson, but declined that offer and did serve as a member of the Mexican Commission and as a member of the Special Diplomatic Mission to Russia headed by Senator Elihu Root. Mr. Mott wrote 16 books, crossed the Atlantic over 100 times and the Pacific 14 times averaging 34 days on the ocean per year for 50 years and delivered thousands of speeches, chaired innumerable conferences, was honored with decorations from China, Czechoslovakia, Finland, France, Greece, Hungary, Italy, Japan, Jerusalem, Poland, Portugal, Siam, Sweden, and the United States. A record of Mr. Mott’s life and work was preserved for posterity with every note, report and letter classified and filed by Mr. Mott’s secretaries and were donated by the family to the Yale University Library where they occupy 230 archival boxes and 95 linear feet of shelf space." These minutes were from a meeting where concerned neighbors came out in force to say "This Place Matters." Hooray! 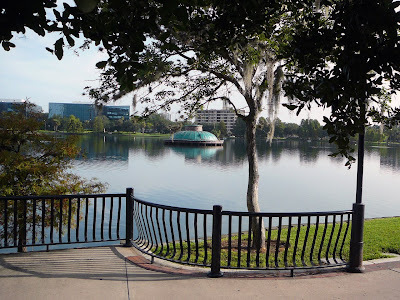 Eola Heights neighborhood featuring some of Orlando's best preserved historic homes. The parcel in question is southeast of the lake. 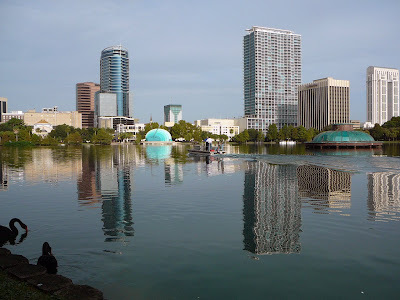 of Lake Eola also threatened with demolition, however, a new business was moving in last time I saw it, so perhaps its demise has been postponed. 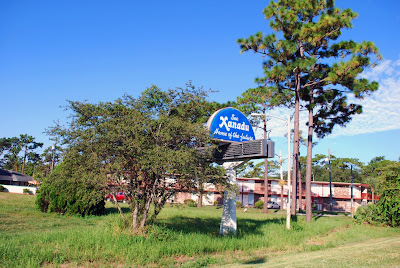 Merchants along the highway discovered a long time ago that one way to get speeding motorists to stop was to erect something large, bright and eye-catching in front of their businesses. Immediately coming to mind are the roadside icons along Route 66 like the recently restored Twin Arrows in Arizona. 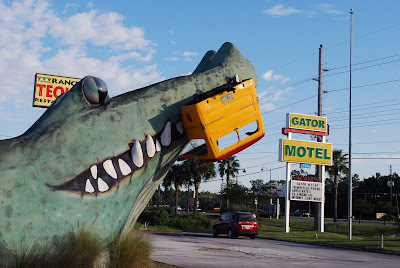 That tradition continues along US 192 in Kissimmee with several eye-catching roadside icons. 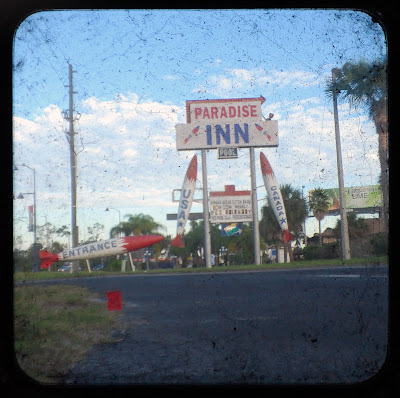 The Paradise Inn in Kissimmee is a family owned and operated hotel offering comfortable hospitality at a price you can afford and giant red, white and blue roadside missiles. 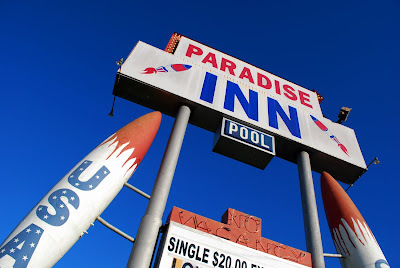 The missiles, (or maybe they're external fuel tanks from airplanes), lead your eye to the sign and I have to wonder what missiles have to do with paradise? 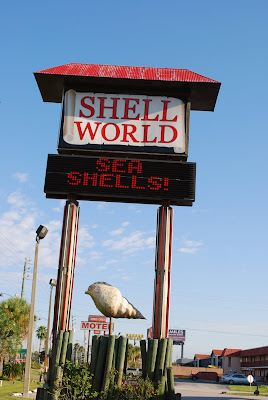 Further up 192 a giant Shell World sign, at least 60 feet high, frames an enormous conch shell. While not as large as the shell at the Shell Factory near Ft. Myers, it appears to be in much better shape. And once you pull in the parking lot the real eye candy is apparent. 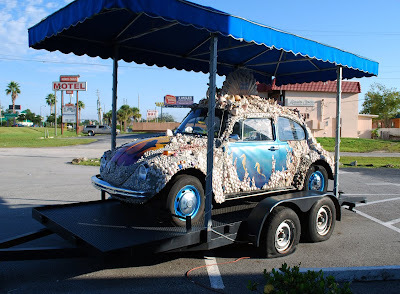 First, there's an old VW bug entirely encrusted with shells. 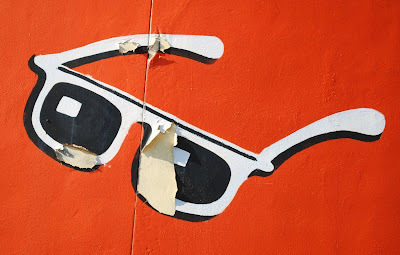 While in need of some repairs, it exhibits the same kind of creative entrepenurialistic folk artisanship that has created so many of our country's roadside treasures. 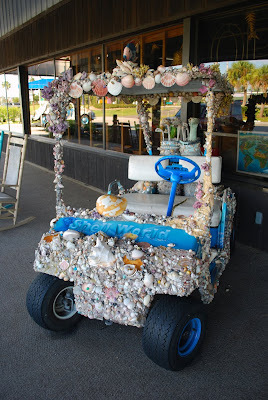 Closer to the entrance is an entire golf cart encased in shells, including the golf bag and clubs. Tacki-licious! 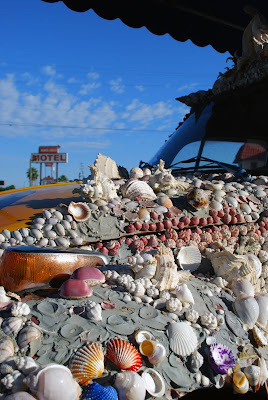 Because I was there before it opened, I couldn't go inside and I missed out on 12,000 square feet of "the most whimsical seashell creatures" from the sea. 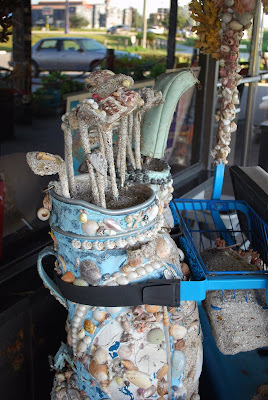 Apparently they also have a Seashell Museum, which I will have to experience on another visit. 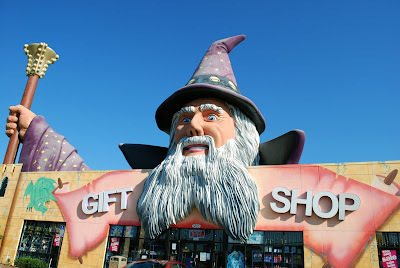 Continuing up the road one cannot miss another gift shop with a giant wizard on top of the facade. 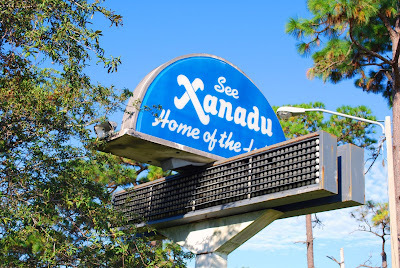 This gift shop was open and it has the usual Florida tourist trinkets that can be found throughout the state, so if you need to get your fix of beach towels and tee shirts made in China, this place is an option. A gift shop further up the road is a gift shop selling slightly more unique items. 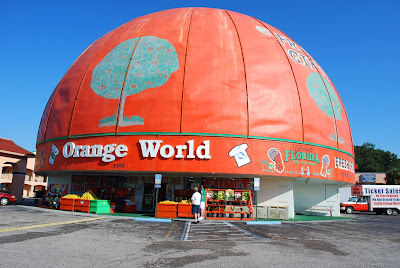 Orange World is a roadside icon difficult to miss; it is the world's largest orange (according to the owners.) At 92' wide, 60' high, 35,000 lbs, this family-owned gift shop has been pulling them in for more than 40 years. 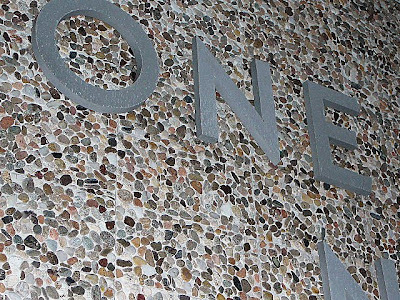 It is one of the finest examples of mimetic architecture in the state. 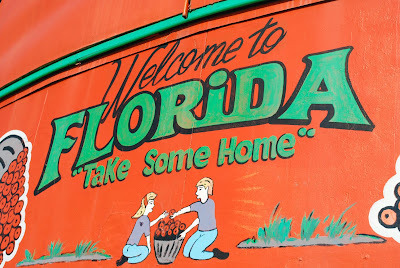 At the entrance you are offered free samples of fresh Florida citrus and encouraged to take some home at a reasonable price. Inside, amid some of the usual tourist stuff, are several rows of items unique to Central Florida including the candies and preserves of Davidson of Dundee. In addition to shipping citrus, the Davidson folks manufacture all natural citrus candies, coconut patties, citrus marmalades, citrus jellies butters and orange blossom honeys. Craving Tangelo butter? They have it! The 32-year old business located in nearby Polk County, offers free tours, with lots of free samples, so expect another post on the subject in the future. 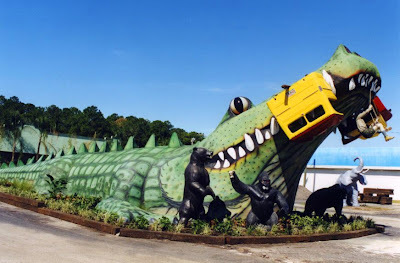 Just down the road from Xanadu sits a giant alligator in the middle of a motel parking lot, marking the site of the former roadside attraction called Jungleland Zoo. 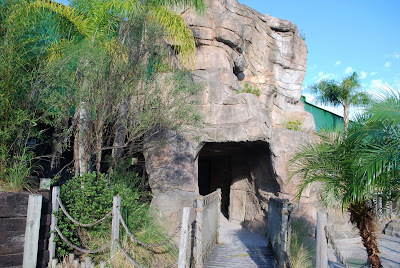 It hasn't been closed very long; it's not on the Lost Parks website, and some websites still show it open. 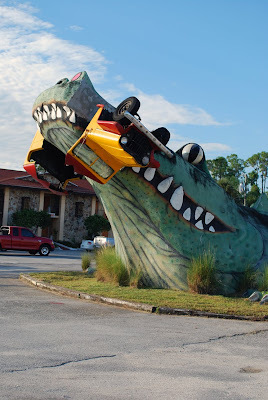 According to Roadside America, it was originally called Alligator Safari Zoo. 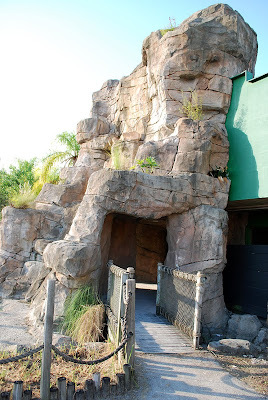 As Jungleland Zoo, the attraction had a history of issues with the state for taking proper care of their animals, in fact in 1997 the attraction made headlines when one of its lions briefly escaped. It appears they closed their doors for good in 2002. 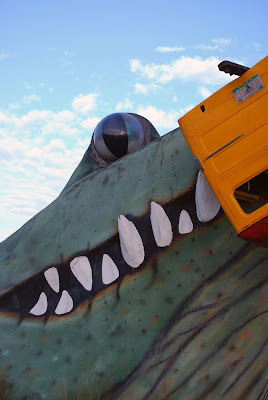 So now the giant alligator, second in size only to Swampy the Giant in Christmas, Florida, sits in a pond of cement between a motel and Mexican restaurant, a giant symbol of another one of Florida's lost attractions. 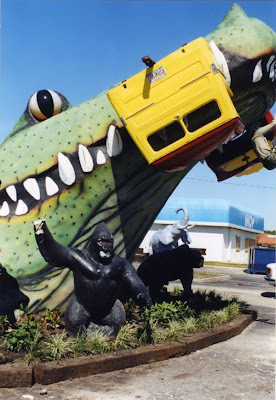 This image, taken in the pre-digital age, shows elephants and gorillas at the base of the alligator. 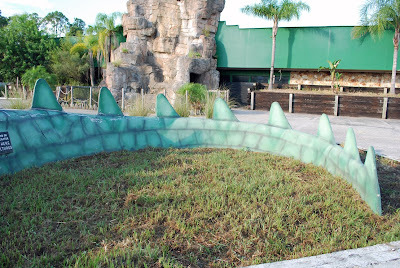 Note the cement critters are now gone. 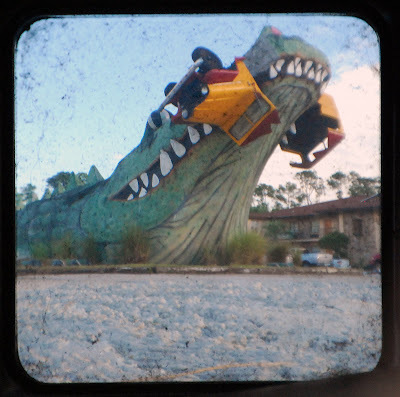 This is my TtV (Through the Viewfinder) image of the gator. It was created by shooting the image on the viewfinder of my old Argus camera. 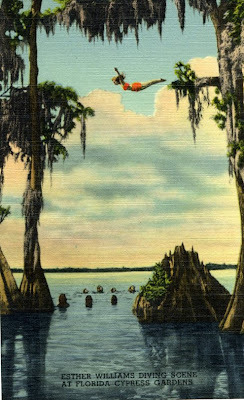 "Set against the background of Florida's Cypress Gardens, and featuring many stretches of water carnival-ballet numbers, the slight story line finds swimming star Julie Hallerton (Esther Williams) in love with Ray Lloyd (Van Johnson), her boss and the creator and operator of the operation. She stays mostly wet, while he stays mostly disinterested in anything other than the cash receipts." A behind the scenes description is available at the TCM website.